Comments - Lovely spring scene of beauties on a verandah overlooking the Sumida River. 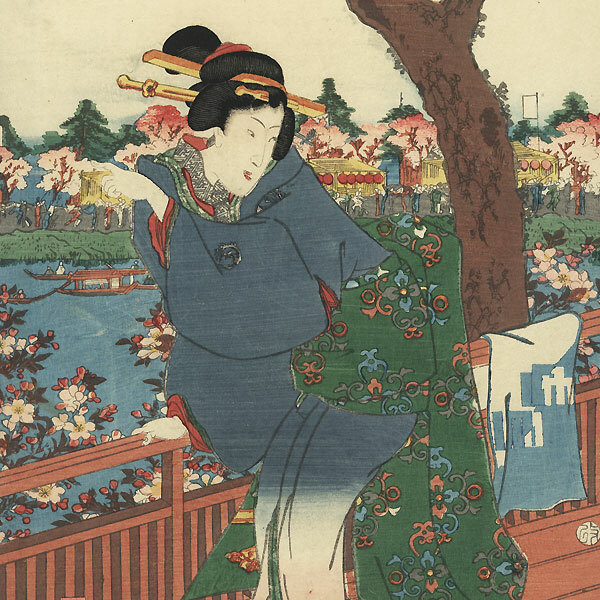 The woman at left smiles at her companions as she gestures across the water, one hand leaning against the railing. 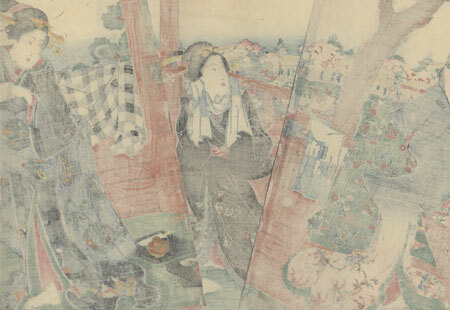 The woman in the center wears a burnished black kimono bordered with strawberries, a blue and white towel wrapped around her neck. Trays of food are set out on the floor for a meal, taking advantage of the spring weather. Cherry trees are in bloom and covered with pink and white blossoms, and the opposite shore is busy with pedestrians strolling along the bank and stopping at tea stand decorated with red paper lanterns. A beautiful Kuniyoshi triptych, attractively colored and detailed with fine bokashi shading in the sky. Image Size - 29 1/4" x 14 1/4"
Condition - With excellent color and detail. Three separate panels. Some slight thinning or paper remnants at edges. A couple creases at edges. Some light toning and soiling. Please see photos for details. Good overall.